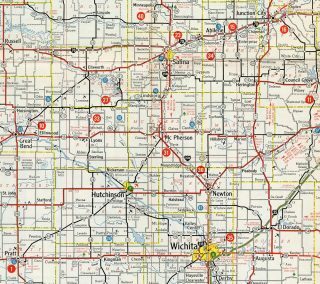 Interstate 135 overlays U.S. 81 from the Kansas Turnpike (I-35) and Wichita in south central Kansas to Salina and Interstate 70. It is the fourth longest three-digit route within the Eisenhower Interstate System, following Interstates 476, 495 in Massachusetts and 287. The freeway bisects Wichita mostly along the elevated Canal Route, a seven mile stretch paralleling or running above the culverted Chisholm Creek Canal. Accommodating six overall lanes, 95,700 vehicles per day (vpd) were recorded along a busy stretch north of U.S. 54 & 400 (Kellogg Avenue) to the east of Downtown Wichita in 2015. Interstate 135, U.S. 81 and K-15 along the Canal Route through Wichita. The flood control basin and drainage ditch network feeds into the canal running between the north and southbound roadways of the freeway. Photo taken 10/20/03. Remaining suburban through Park City and Valley Center, Interstate 135, U.S. 81 & K-15 leave the Wichita metropolitan area for a rural course to Newton and a brief overlap with U.S. 50. K-15 splits to the north from there as I-135 shifts northwest to McPherson and the north end of the K-61 expressway connecting with Hutchinsin. Turning northward again, Interstate 135 & U.S. 81 continue by Lindsborg to Salina. 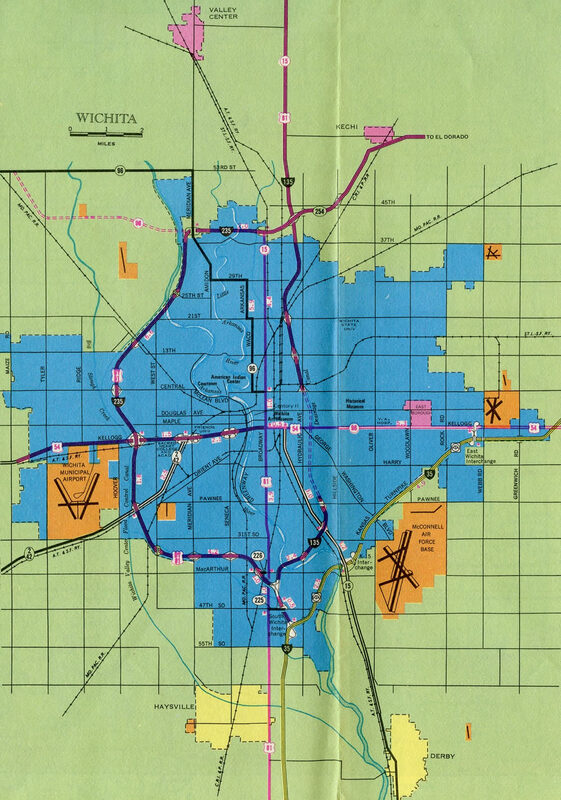 The freeway generally bypasses the city of nearly 50,000 to a rural cloverleaf interchange with I-70 & U.S. 40. I-135 ends there, with U.S. 81 extending north as a freeway then expressway to Concordia. Interstate 135 in its entirety, along with the route served by U.S. 81 and U.S. 77 north to Sioux City, Iowa, is part of High Priority Corridor 23: Interstate Route 35 Corridor. 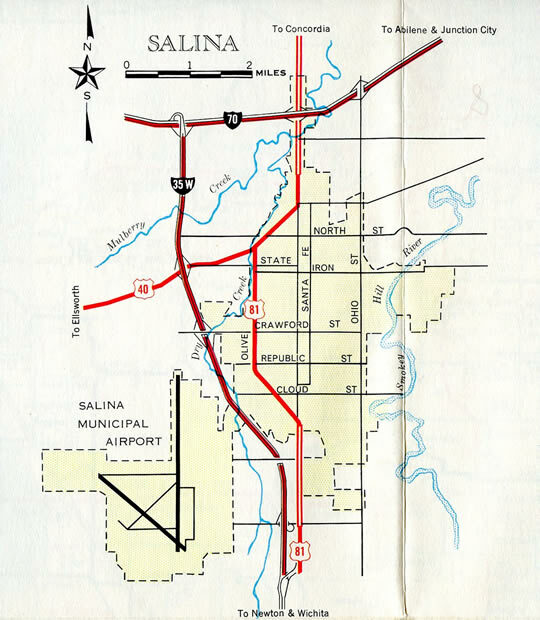 Interstate 35W utilized the preexisting Newton bypass and was complete in the Salina vicinity by 1965. The Newton bypass was constructed in the 1950s initially as a connector from U.S. 81 on Kansas Avenue to U.S. 50 at the current wye interchange (Exit 33) with I-135. As approved by AASHTO on July 13, 1976, Interstate 35W was renumbered as Interstate 135 on September 13, 1976. There are two remaining I-35W’s nationally, one at Fort Worth, Texas and the other through Minneapolis, Minnesota. Interstate 135 & U.S. 81 advance north from the diamond interchange with K-140 west and State Street east 2.25 miles to Interstate 70 & U.S. 40 in rural Elm Creek township. Photo taken 11/01/16. A nearly transcontinental route, Interstate 70 meets Interstate 135 at a full cloverleaf interchange (Exits 95A/B). I-70 connects Denver with Kansas City across the width of Kansas. Photo taken 11/01/16. Exit 95A departs in one half mile for Interstate 70 & U.S. 40 east to Abilene, Junction City and Manhattan. The two routes run concurrent to the East Topeka interchange of the Kansas Turnpike. Photo taken 11/01/16. Travelers joining I-70 & U.S. 40 east from I-135 & U.S. 81 will reach I-470 and the capital city of Topeka in 105 miles. U.S. 81 continues north as a freeway for another 18 miles en route to Minneapolis and Concordia before entering Nebraska north of Belleville. Photo taken 11/01/16. Exit 95B loops onto Interstate 70 & U.S. 40 west towards the city of Hays. Roughly 420 miles of I-70 separate Salina with Denver, Colorado. Photo taken 11/01/16. Three miles north of the cloverleaf interchange joining the U.S. 81 freeway with Interstate 70 & U.S. 40 and Interstate 135. 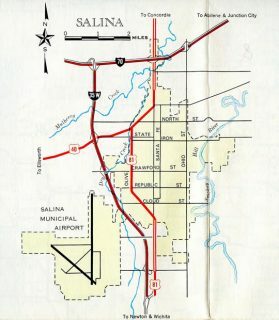 The city center of Salina is located 4.4 miles to the southeast of the forthcoming exchange. Photo taken by Ben Prusia (10/16/02). U.S. 81 south makes a gradual curve from K-143 to cross the Saline River on the two mile approach to Interstates 70 and 135. Photo taken 11/01/16. Exit numbers appear for the U.S. 81 ramps to Interstate 70 west to Hayes and Colby and east to Manhattan and Topeka, on the one mile guide sign. Photo taken 11/01/16. U.S. 81 spans Pleasant Hill Road south amid agricultural areas just ahead of Exit 95B for I-70 & U.S. 40 west. The two routes overlap 174 miles westward to Exit 76 at Oakley. Photo taken 11/01/16. Interstate 135 appears on the U.S. 81 pull through panel as Exit 95B parts ways for I-70 & U.S. 40 west. 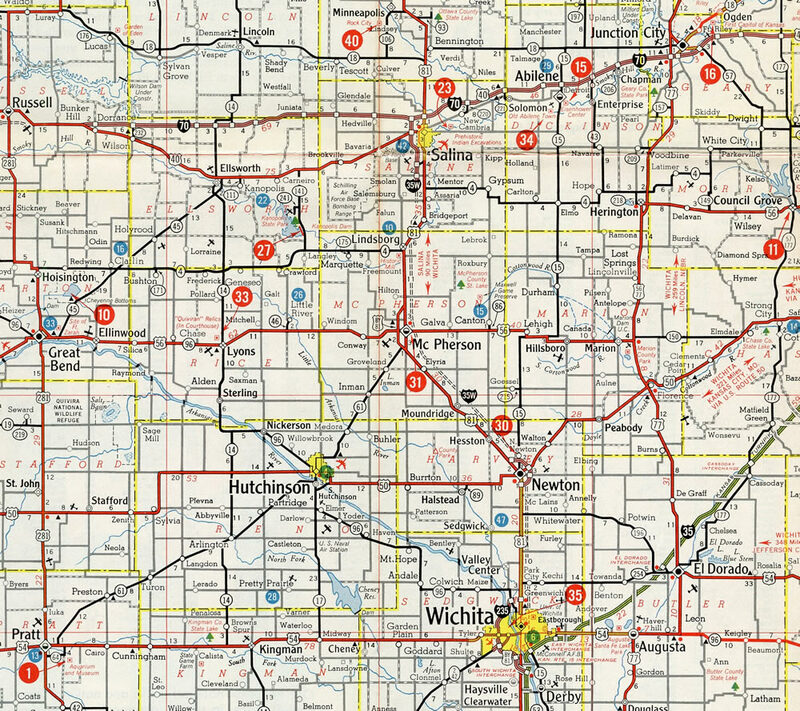 U.S. 81 follows I-135 south for all but the southern link to the Kansas Turnpike in Wichita. Photo taken 11/01/16. Leading east from Salina, Interstate 70 & U.S. 40 travel to Topeka, where they split at the Oakland Expressway and Kansas Turnpike for separate routes to Bonner Springs and the Kansas City metropolitan area. K-140, two miles to the south, represents the old U.S. 40 alignment leading west to Ellsworth. Photo taken 11/01/16. Prior signs installed for Interstate 135 at I-70 both acknowledged the U.S. 40 concurrency and used local control cities. Russell, situated at U.S. 281 (Exit 184), was referenced for Exit 95B for westbound, while Exit 95A directed traffic to adjacent Salina to the east. Pull through signage for I-135 omits Wichita presently. Photo taken by Michael Summa (1986). A half mile separates Halstead Road from the ramp departure of Exit 250A for Interstate 135 & U.S. 81 south along the west side of Salina. Salina represents the largest collection of traveler services on I-70 east since Russell, 66 miles to the west. Photo taken 11/01/16. Interstate 135 & U.S. 81 run south through Salina with five interchanges servicing the Saline County seat. 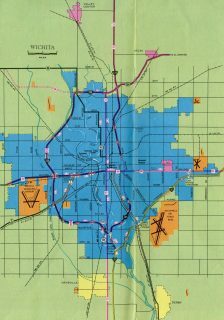 The northern suburbs of Wichita lie 75 miles to the south. Photo taken 11/01/16. Interstate 70 & U.S. 40 progress west from the diamond interchange (Exit 252) with K-143 (old U.S. 81) to Exits 250B/A with Interstate 135 & U.S. 81 south to Wichita and U.S. 81 north to Concordia. Photo taken 11/01/16. U.S. 81 extends north from the I-135 end as a freeway or expressway to Minneapolis, Concordia and Belleville. The route south combines with I-135 through Salina, Newton and Wichita. Photo taken 11/01/16. Exit 250A loops away from Interstate 70 & U.S. 40 west for I-135 & U.S. 81 south. The freeway splits with the K-61 expressway at McPherson to provide part of a high speed route to Hutchinson. Photo taken 11/01/16. A previous set of signs posted along Interstate 70 west for the 1979-completed route of Interstate 135. Minneapolis was replaced by Concordia on subsequent sign replacements. Photo taken by Michael Summa (1982). Hays replaced Russell on the I-70 west pull through panel at Exit 250B. This panel was eventually dropped from sign plans. Photo taken by Dale Sanderson (10/02). A three lane off-ramp departs from Interstate 135 & U.S. 81 south just after the merge with I-235 south. Here U.S. 81 dog legs west from Exit 1A to rejoin Broadway south to Haysville via 47th Street South. Photo taken 11/01/16. Traffic remaining along Interstate 135 south defaults into the Kansas Turnpike toll plaza ahead of the trumpet interchange with Interstate 35 northeast to El Dorado and Emporia and south to Wellington and Ponca City, Oklahoma. An end sign for I-135 stands at the 47th Street South overpass. Photo taken 11/01/16. Prior to an ARRA funded redesign between 2009-11, Interstate 135 and U.S. 81 south split at a full cloverleaf interchange (Exits 1B/A) with 47th Street. U.S. 81 departs from Interstate 135 at 47th Street South after sharing a 94 mile overlap. The US route continues southward to Wellington along a parallel alignment of the Kansas Turnpike to the west. The former alignment through Wichita followed Broadway. Photo taken by Ben Prusia (03/02). Exit 1A was originally the loop ramp taking traffic from the ending Interstate 135 south onto 47th Street east toward McConnell Air Force Base. The base was the site of an F4 tornado that struck the area in April of 1991. Photo taken by Richie Kennedy (03/01). Replaced by 2015, the one mile sign for Exit 42 and Interstate 135 north appears at the 63rd Street South underpass along the Kansas Turnpike north. Sign specifications for Exit 42 include both I-235 and U.S. 81 for the adjacent exits of I-135, similar to practices found on the Pennsylvania Turnpike, where nearby routes are included as if they were served directly by the toll road. Photo taken 10/20/03. One half mile south of the trumpet interchange (Exit 42) with Interstate 135 on I-35 north ahead of Big Slough. A 30 MPH placard was later added, with the whole assembly replaced by 2015. Photo taken 10/20/03. Interstate 35 turns northeastward towards El Dorado, Emporia, and Kansas City as Exit 42 parts ways for I-135 north through Wichita. U.S. 81 accompanies Interstate 135 from 47th Street South nearby, while I-235 forks west from the freeway to Eisenhower International Airport (ICT). Greenouts added to these overheads by 2012 added Wichita for I-35 and amended Wichita to South Wichita for Exit 42. Photo taken 10/20/03. 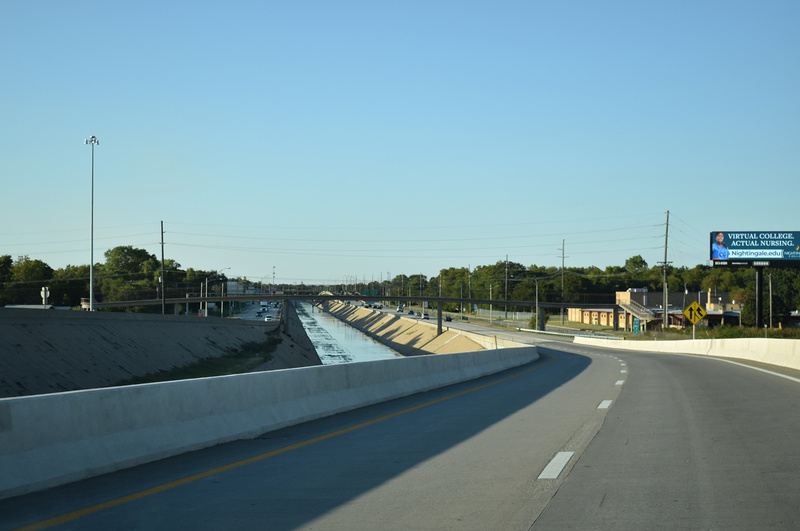 Following the Arkansas River, which is being redecked as part of a two year project started on March 2, 2016,5 the Kansas Turnpike curves southwest on the two mile approach to Exit 42 with Interstate 135 in south Wichita. Photo taken 10/31/16. Exit 42 is the last of four Wichita exits along the Kansas Turnpike. Interstate 35 angles southwest from Andover across southeastern reaches of the city by McConnell Air Force Base to cross paths with K-15 ahead of the south end of I-135. K-15 merges with I-135 north along the Canal Route through central Wichita. Photo taken 10/31/16. Exit 42 departs from Interstate 35 (Kansas Turnpike) south for Interstate 135 north for the seven mile drive to Downtown Wichita. Connections with U.S. 81 lead motorists west to Broadway and I-235 to the western suburbs along U.S. 54 & 400 (Kellogg Avenue). Photo taken 10/31/16. “Big Ditch bridge art on city agenda.” Wichita Eagle, The (KS), October 3, 2011. “Stimulus Money Funding 2-Year Project.” Wichita Eagle, The (KS), August 29, 2009. “$2 million break marks winning bid for McPherson County I-135 interchange project.” Hutchinson News, The (KS), November 11, 2015. “Arkansas River Bridge project to begin March.” Kansas Turnpike Authority, news release. February 29, 2016. “Ribbon Cutting to Mark Completion of I-135 Interchange in McPherson County.” Salina Scoop (KS), March 31, 2017. Page updated August 2, 2017.